How to diversify revenue streams has long been a hot topic in the news industry, points out Janine Warner, co-founder and executive director of SembraMedia, and chair of a Friday panel on the subject at the 19th annual International Symposium on Online Journalism. “But now we have growing evidence that media companies that have built business models that go beyond just advertising and subscriptions are reaping the rewards,” says Warner, also an ICFJ Knight Fellow, Latin America. “All of the panelists in the Revenue session at ISOJ have developed new ways of making money that are models for others. I’m especially interested in learning about how they are building relationships with readers that lead to significant donations — and just how much of the total expenses they think readers can cover,” she elaborated. Indeed, two members of the panel are passionate about fostering deeper connections with the audience and the willingness of readers and viewers to pay something for content. Rob Wijnberg, editor-in-chief and founder of Netherlands-based De Correspondent (or The Correspondent in the U.S.), believes “the future of independent journalism lies in membership,” which is connected to trust. “Membership distinguishes itself from subscription as follows: subscribers buy a product, members join a cause. In effect, membership requires a clear journalistic philosophy: What are the underlying principles for what we cover and why we cover it?” he asked. Wijnberg promises to elaborate on how news outlets can regain that trust when he sits down for the Friday morning panel at ISOJ with Alex Clark, founder of PressPatron in New Zealand. PressPatron, launched in early 2017, makes it easy for news consumers to pay a monthly or one-time fee to their favorite media outlets. “Our most successful publishers have converted between 1 percent and 5 percent of their audience, across a broad range of sites that include both for-profit and non-profit organizations,” he said. 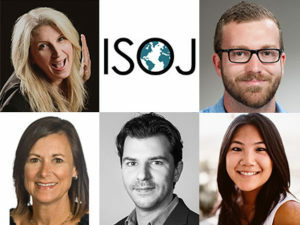 Two other media professionals taking part in the Revenue panel will no doubt have plenty to offer the ISOJ audience. April Hinkle is chief revenue officer at Texas Tribune, the successful nonprofit news website co-founded in 2009 by venture capitalist John Thornton, whose mantra at the time was “revenue promiscuity” to describe the Trib’s approach to chasing revenue from more than one source. After more than two decades at Texas Monthly, Hinkle is now responsible for the Tribune’s corporate revenue programs, speakers’ bureau and licensing of content. Warner, chair of the Revenue panel, is excited about what ISOJ participants might hear from her colleagues.